DART is finished replacing its fareboxes, which were more than 20 years old, with new fareboxes in fall 2018. Please read more about these upcoming changes by either clicking on the links above to be directed to a section, or by scrolling through the information below. Some DART riders may be able to purchase bus passes at reduced rates through DART's Reduced Fare program. More information on these programs available here. You can now buy a paper day pass from the new fareboxes and from Customer Service located in DART Central Station. These passes all cost $4 and allow you to take an unlimited number of trips on the day you buy the paper pass. Half-fare day passes are also available for our riders who qualify through DART’s Reduced Fare programs. 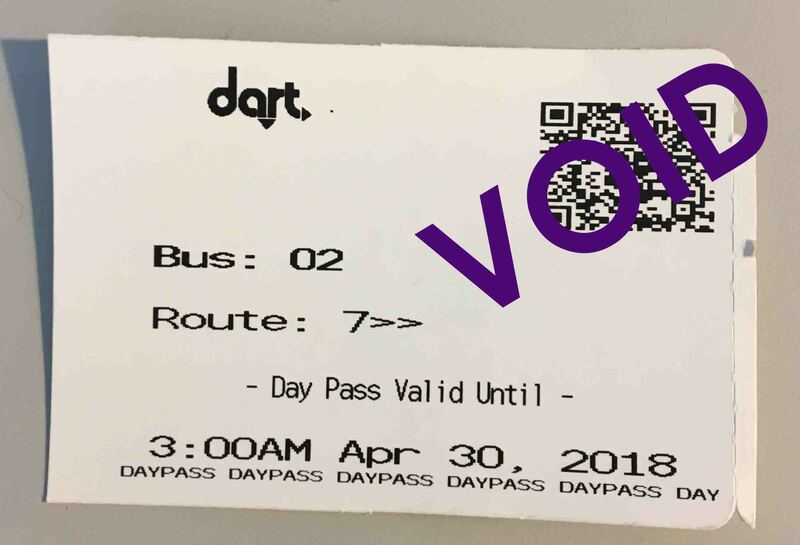 Day pass from farebox: The above is an example of a day pass purchased from DART's new fareboxes. These passes do not need to be scanned when you buy it from a farebox, however each additional time you board a bus you should scan the QR code on this pass on the farebox. 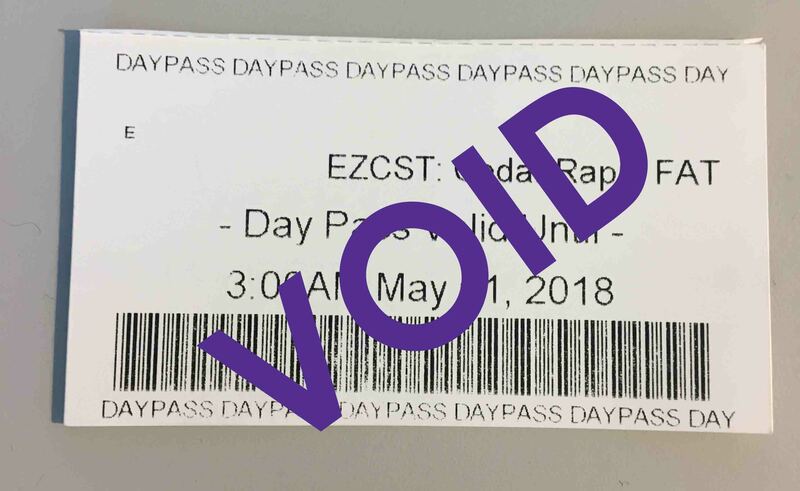 Day pass from customer service: The above is an example of a day pass purchased from DART’s Customer Service window. The barcode on these passes should be scanned on the new fareboxes on DART’s buses. Day pass from the MyDART app: Day passes are currently available in the MyDART app. Day passes in the app can be used an unlimited amount of times on the service day the pass is activated on. MyDART app tickets now include QR codes on each ticket. When you use the app, please scan the code on your ticket on the new fareboxes instead of showing it to the driver. If you buy and use multiple tickets for multiple passengers, you will need to scan each QR code on each individual ticket when boarding the bus. Please note that depending on the size of your phone screen, riders may need to tap on the QR code to increase its size to make it large enough for the farebox to scan. DART has installed new fareboxes on all of its buses. DART is now working on putting our new fare policy into place. As part of this, paper transfers will be discontinued effective Nov. 1, 2018. Riders with questions or concerns about these changes are encouraged to contact DART Customer Service by email, or by calling 515-283-8100 option 0. Riders can buy a day pass for $4 from the new farebox, from DART Customer Service or through the MyDART app. MyDART app tickets include a QR code that scans directly on the farebox. Paper transfers will be discontinued Nov. 1. DMPS students scan the QR code on their ID’s directly on the farebox. Fareboxes will still accept tokens, cash fares, and monthly and weekly bus passes. Please be aware that fareboxes do not give change.